When you’re young and discover you love reading, nothing is better than finding the kind of book that takes you away and absorbs you for hours. As a child, I felt this way when I discovered books like The Secret Garden, Charlotte’s Web and the entire Narnia Chronicles. Transported. It’s not so common to find this kind of immersive reading experience when you’re an older reader, so discovering one of these reads is a treasure to be cherished. That’s a long way of saying that Sujata Massey’s Perveen Mistry series are just such immersive, absorbing and captivating reads. 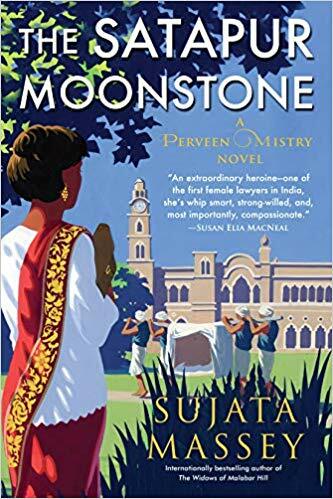 The Satapur Moonstone is the second in her series featuring female lawyer Perveen Mistry. She works for her father’s firm in Bombay in the 1920’s, and she’s an unusual example of early feminism. Because of her gender, she can’t argue cases in court, but Massey is ingenious in finding ways that Perveen’s gender works to her advantage rather than her disadvantage. The first novel, as all first novels should be, was Perveen’s origin story, where she establishes herself amid a great deal of struggle. This second novel is more of an adventure with all that implies – a journey through the jungle in a palanquin, monkeys, a tiger, several maharajahs (dead and alive), a moonstone necklace, and a palace full of maharinis attempting to decide what’s best for a young maharajah who is too young to assume power. Perveen is appointed by the British government (something she has mixed feelings about, as she’s a great admirer of the young Gandhi and is hoping for India’s freedom) to journey to the far away Satapur and discuss the Maharajah’s education with the maharinis – one his grandmother, one his mother – who are in complete disagreement about his future. One wants an English boarding school, one wants a tutor. Perveen’s journey by train and through the jungle to arrive at the “Circuit House” where the British government official lives is a long and arduous one, and when she arrives she learns she has another long journey through the jungle by palanquin before she will arrive at the palace. They’ve refused entry to the male government agent as they are women living in purdah, so the thought is that Perveen will have a better chance at entry, both by virtue of her gender and her nationality. Perveen does eventually gain entry to the palace after almost being refused because she looks so dirty after her trek through the jungle, and what she finds there is a morass of resentments and a history of sudden death that stretches from the young maharajah’s father to his recently dead older brother, who was eaten by a tiger on a hunt. In the first novel, Perveen’s origin was all, slowly and masterfully revealed. In this novel, the sinewy, delicious, tricky story is all, as Perveen uncovers motivations and hatreds and unexpected goodness as well. The characters are just as firmly etched and brought to life on the page as they were in the first novel. It’s fun to see Perveen using her mind as she solves this puzzle. You seriously will not want to stop reading, and finishing the book – coming back to the 21st century after being immersed in 1920’s colonial India – is somewhat jarring. Though it’s a year away, I cannot wait for Perveen’s return. Fans of Barbara Cleverly, Rhys Bowen and Susan Elia MacNeal will enjoy these books.